What a great start of 2018 in Morocco, where they organised the first ever women only PWA wave event and the first PWA event of the year. And we got absolutely insane conditions! I arrived a week prior to the event, to get used to the conditions in Moulay and to get some starboard tack sailing in before the competition. We had wind six days in a row and we had completely different conditions every day. 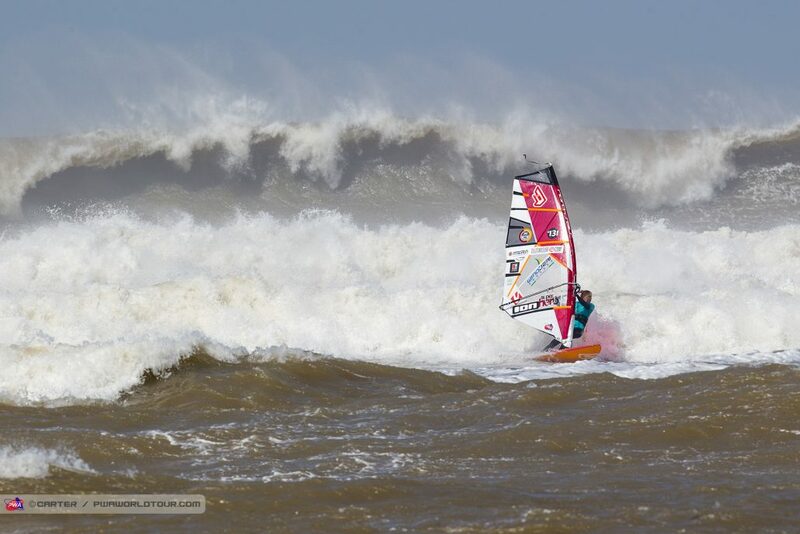 From 3.4 overpowered, super light wind or over mast high waves; Moulay delivered it all. I was very glad I came earlier, as I felt I was improving every day. I stayed in a super nice apartment right at the beach. Moulay is a very little village but they have a few very nice restaurants and places to stay. Sadly enough I got some bad news from Holland, as my grandmother died very unexpectedly. I wanted to be home for the funeral so I decided to fly back for just a day. Although it was a very sad day, I’m so happy I went home and it felt so good being there together with my family. The day after I came back the competition started. The first day of the competition we didn’t have any wind. I was quite happy with that, as I was still pretty tired from the traveling and preferred a day of rest. The forecast looked very promising so we were not worried about getting results in. The day after looked good and we started with the single elimination. We were running four men’s (or women ;-)) heats, unlike most events were we are sailing one on one. I was up against Lena Erdil, Iballa Moreno and Aurora. Not an easy heat to pass.. and so I was quite nervous. I went out on my 4.7 and 76 liter board and as soon as the heat started I forgot about the nerves and was just enjoying my heat. I managed to ride some really nice waves and caught some big ones, and I managed to pass my heat. My next heat I was up against Maria Andres, Iballa Moreno and Lina Erpenstein. An even harder heat, but I felt good on the water. I knew I had to step up my game a bit to pass this heat and I wanted to go a bit more vertical on the waves. My second wave of the heat I went for it and got my highest wave score in ever; a 6.35. This was a superb score and I would have only needed a 4 point wave to pass to the semi finals, but I didn’t know this and I kept going big on my waves and didn’t manage to get another alright wave score in. A bit upsetting, but at the same time I was very happy with my sailing in both my heats so I am happy and I hope to do even better next time. The swell got WAY bigger than I thought, with two times mast high ( up to nine meter waves) sets rolling in. The judges canceled it for the day, as it was just to extreme to go and compete. I did go for a free sail in the shore break, which was already mast high, and with sooo much white water every where. Sadly enough we didn’t get any other day in with enough wind and a not too massive swell, so we only managed to finish the single elimination that week. So, I stayed in 7th place for the first event of the year. My best ever result in waves so I’m happy! From Morocco I flew back to Amsterdam for a few hours, and right now I’m already in Bonaire! The wind has kicked in the day I arrived, and in a few days my Yoga & Windsurf clinic will kick off. Can’t wait. I made a little clip of my time in Morocco which I will put online this week, so stay tuned if you like to see it.